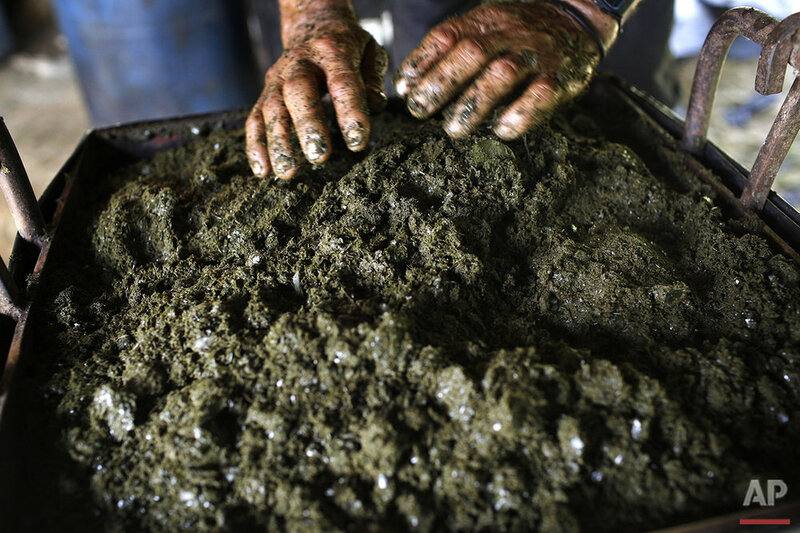 In bright green Andean mountains wrapped in clouds, a country family produces the coca paste that is used to make cocaine at a humble home in territory controlled by the Revolutionary Armed Forces of Colombia, or the FARC. The family head explained the process, speaking on condition of being identified only by his first name, Gonzalo, for safety reasons. 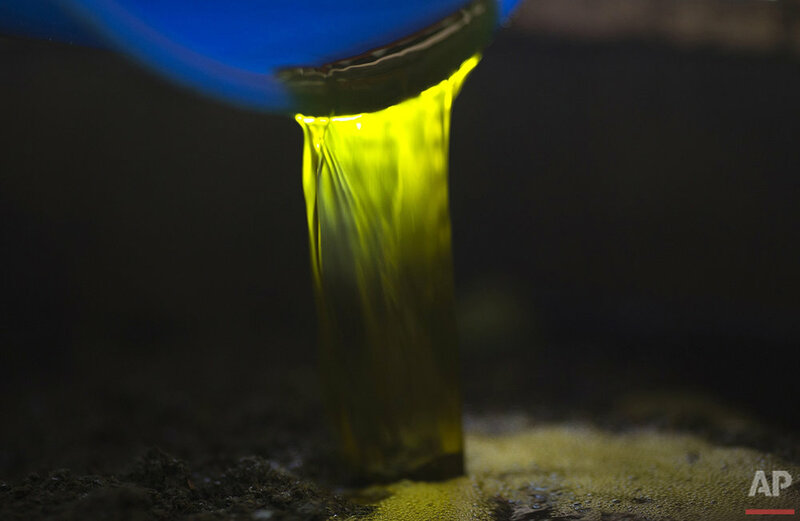 It begins with the coca plants, which grow just two months in a tropical, temperate climate before they are harvested. Family members pick the leaves, helped by neighbors who pitch in, wrapping their hands with bandages to protect them from blisters. The cloth is stained green as they quickly pick the leaves and stuff them into cloth bags. Later, the leaves are mulched and sprinkled with cement powder, then mixed into big vats that contain gasoline, ether and other chemicals. Family members wear masks because it can be hard to breathe amid the chemical vapors emanating from various buckets marinating the huge mix of leaves. To that brew, the family adds chemicals including ammonia and sulfuric acid. The process ends in the family kitchen, using the same burners where beans and plantains are set to boil. Cooking the yellow paste evaporates the chemicals, and finally it's all crushed to be packed and sold. 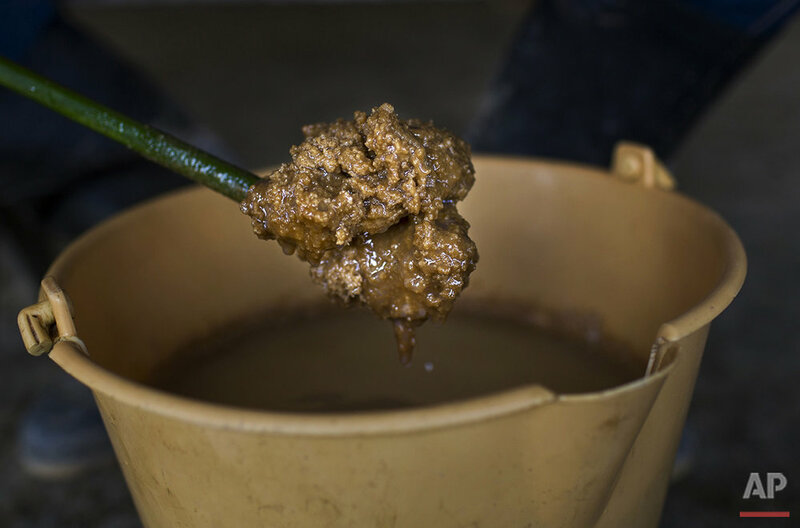 The family can get about $900 for a kilogram (2.2 pounds) of the base paste, which is the first link in a long economic chain of intermediaries. At some point along the way, the paste is turned into cocaine, eventually being sold on the streets of such places as New York and Amsterdam for many thousands of dollars. When afternoon comes, Gonzalo and his family gather to chat on their patio. The possibility of wiping out coca crops, an issue already agreed to at talks in Havana between the Colombian government and the FARC, seems far away for Fernando Zapata, the communal president of the village who has stopped by for a visit. "We will confront anyone who touches our plants," Zapata said. "They want to do away with the livelihood of our families and the entire region." 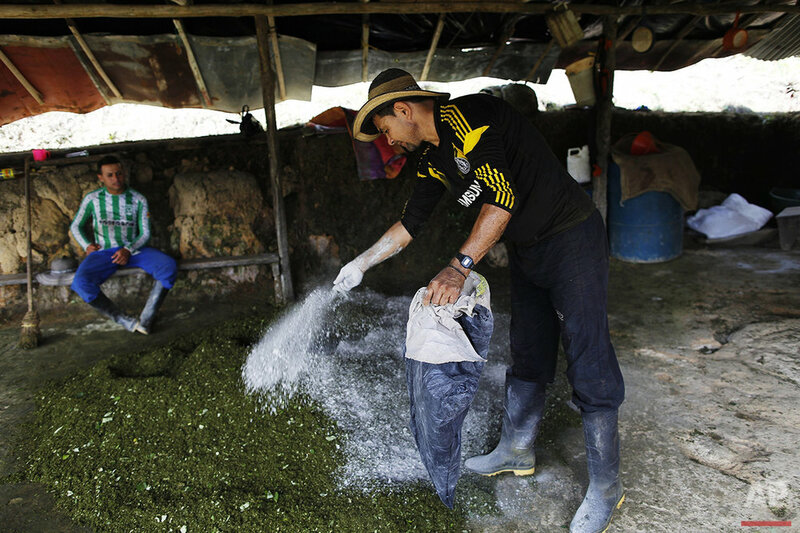 Text from the AP news story, AP PHOTOS: The route of Coca paste production in Colombia.